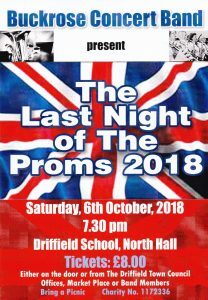 Join us for our epic concert at Driffield School North Hall for all things Proms plus much more! Tickets on sale from Driffield Town Council Offices, Market Walk, Driffield, any member of the band or on the door. Bring a picnic and enjoy the fun!